Posted on March 28, 2018 at 11:58 pm. A feature wall is a single wall of a room that is decorated while the other walls are left plain. If done well these can add style and mood to a room. If a whole room is decorated with too much detail it would feel crowded, and perhaps restless. On the other hand a lack of detail might feel empty. The feature wall, basically the one wall of the room that is given a standout texture, pattern or colour, mixes these two extremes. Tiles are a good option for a feature wall. 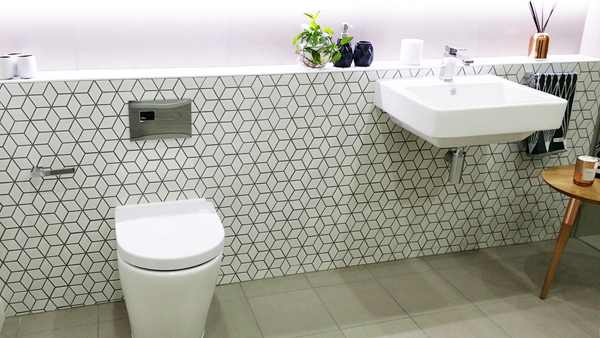 A tiled bathroom wall may be as simple as connected geometric shapes or as complex as a mosaic. Either can be effective. Another option is a light tiled pattern on one wall with a single bold colour on another wall. This can be enough to make the bathroom look impressive. As long as there is a balance between striking detail and open surfaces the result will be dramatic. With polished tiles, the glossy reflective surface helps make the room feel larger. And if the tile pattern is simple and geometric the room will not be compromised by detail. Mirrors, often on cabinets, help here, though they can make the room feel over-detailed if they reflect a detailed wall. The look of timber adds warmth to a room. Timber tiles achieve the same look as real timber, and a wooden décor bathroom can look very stylish indeed. Modern tiles benefit from large production runs and improving manufacturing techniques. This means good quality tiles are cheaper than ever and available in countless styles. Take advantage of this and have the home tile décor you have always wanted.